While growing up in Florida, I began making Super 8 movies and Monty Python inspired animations in high school. At the time, my Mom was working as a commercial artist for a small company that produced multimedia slideshows. They used multiple slide projectors -- about 9 of them -- for corporate and trade show presentations and wanted to do limited animation using this format. They bought a few books about animation as well as some equipment like an animation disc and some cel paint. Mom wasn't sure what to do and didn't understand where to bring the whole animation process. 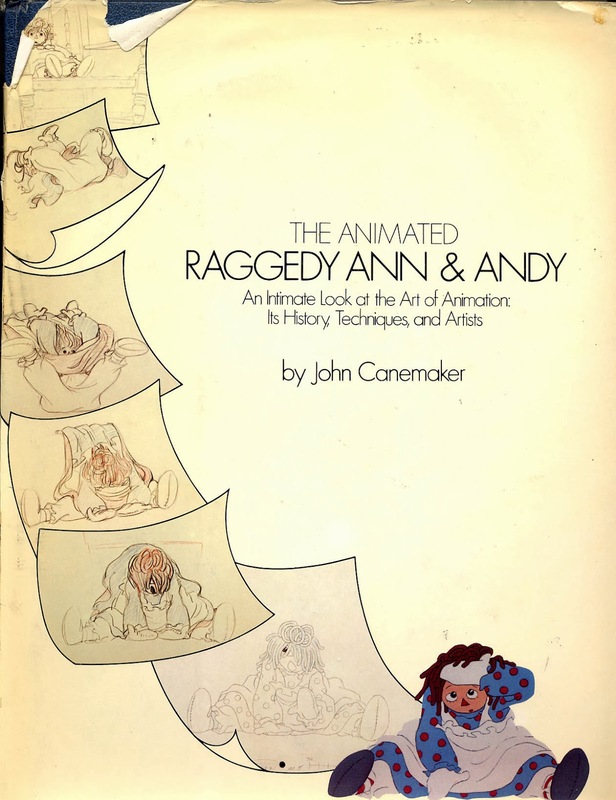 I would meet her at work after school and I'd quietly study this hardcover animation book called "The Animated Raggedy Ann and Andy" by John Canemaker. This book gave me a glimpse into how an animated film was made and featured the animator/director Richard Williams. Many years later while in Chicago, I stumbled upon a large book sale in a mall parking lot. Tons of tables were filled with books of all kinds. No organization -- just books, books and more books. As if I were attached to an invisible cable, I saw an old familiar friend at the very first table I walked up to. There it was, on top of a pile of other books -- my favorite hardcover animation book from long ago. I couldn't believe my luck and even though there was some slight water damage, all the pages were intact. I couldn't believe they wanted only $2 for it. It was even signed by John Canemaker! I bought the book right away and took it home to look through it again. Another surprise was revealed when I opened the book to page 238. 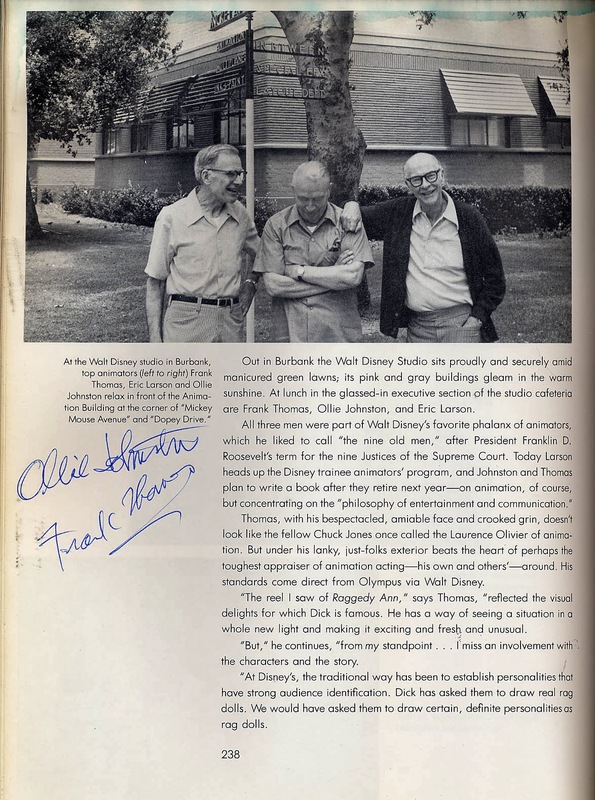 Under the photo of three of Disney's nine old men -- Ollie Johnston, Eric Larsen and Frank Thomas -- were two of their signatures. My $2 investment had really paid off. 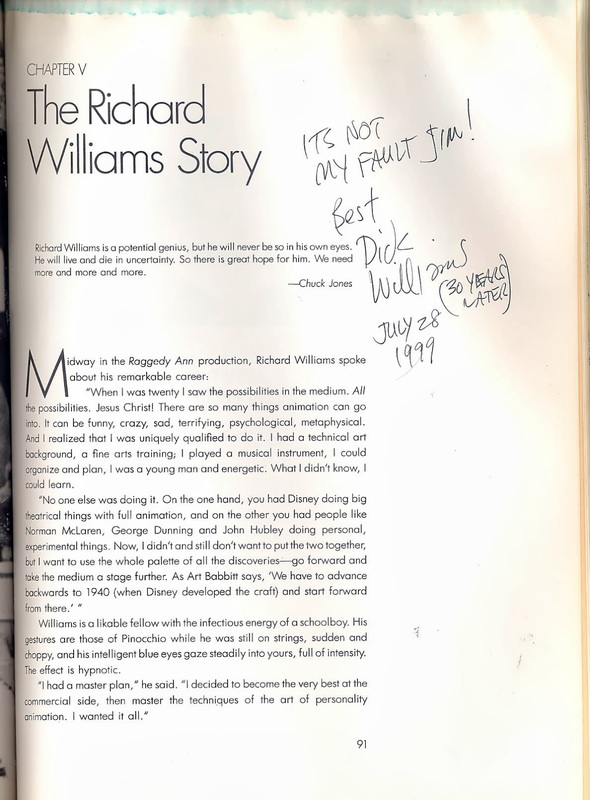 More time passed and, while working at Will Vinton Studios, I got an opportunity to meet Richard Williams. Will had invited him to speak to the studio's stop motion and CG animators. 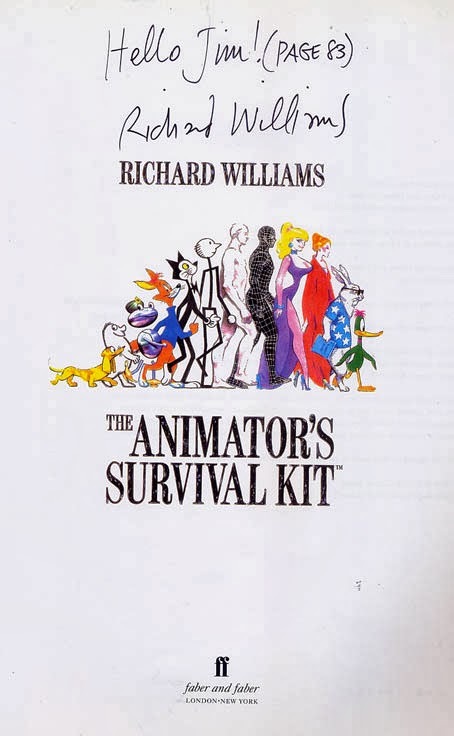 Around 1995, Vinton had begun producing the first CG animated M&M commercials and Williams had begun giving a masterclass based on a book he was then writing, "The Animator's Survival Kit". Will Vinton threw a dinner party in his honor the night before the weekend class. Several animators knew Williams did "Roger Rabbit," but I was a little fan struck. I mean, here's a guy I read about as a kid! I remembered "The Pink Panther" title sequences and I really think Williams and John Canemaker's book opened the animation door for me. So I was the only person at the party carrying my book around. I finally got to meet Williams and he was just as nice as could be. I told him about the history of the book I was carrying and showed him the signatures. He then added his as well. He mentioned he was writing an animation book which would be out in a few years. I told him about my 2D background and asked him if he ever thought about doing any computer animation. He laughed and shook his head, " No, I think I finally figured out drawing animation part, but I don't think I could learn computer animation now." I told him how the first few weeks of learning to use the computer instead of pencil and paper was really difficult for me. I told him that it felt like I was animating with a microwave. The model is in the box and you have to make it move using a keyboard and a mouse. Williams exploded with laughter and grabbed a little pad of paper. "That's great! Yes, animating with a microwave! That's funny. Yes, I'm putting that in the book." 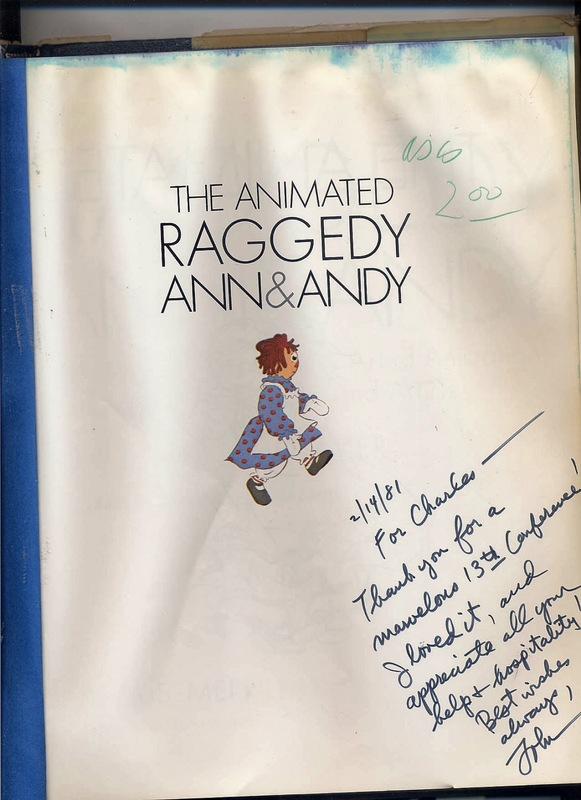 And so, when "The Animator's Survival Kit" book came out, I brought my copy to DreamWorks where Williams was speaking to a large group of animators and animation fans. He remembered me from Vinton and gladly signed my book. So now you know the story of the bottom of page 83.